Due to the continuation of the staircase by slabs at its base and top, bending moment is formed in the supports (up-per fibers) and therefore, rebars are required both at their upper fibers. In most occasions, staircases are continued by the floors’ slabs, as in the previous example; therefore, they contribute to the seismic diaphragmatic behavior of the floors’ slabs. During an earthquake, slabs sway only along their horizontal plane and consequently they are not stressed by additional flexure. On the other hand, the staircases, due to their slope, transfer the diaphragms’ seismic forces to the columns. This subjects them to deformation transverse to their plane which causes the formation of seismic flexural moments. All the above show that staircases behave like slabs when vertical loads are applied upon them and like beams when they are stressed by earthquake forces. Since the seismic loads continuously shift direction, the applied earthquake stresses constantly appear reversely therefore, staircases require rein-forcement both at their upper and lower fibers. 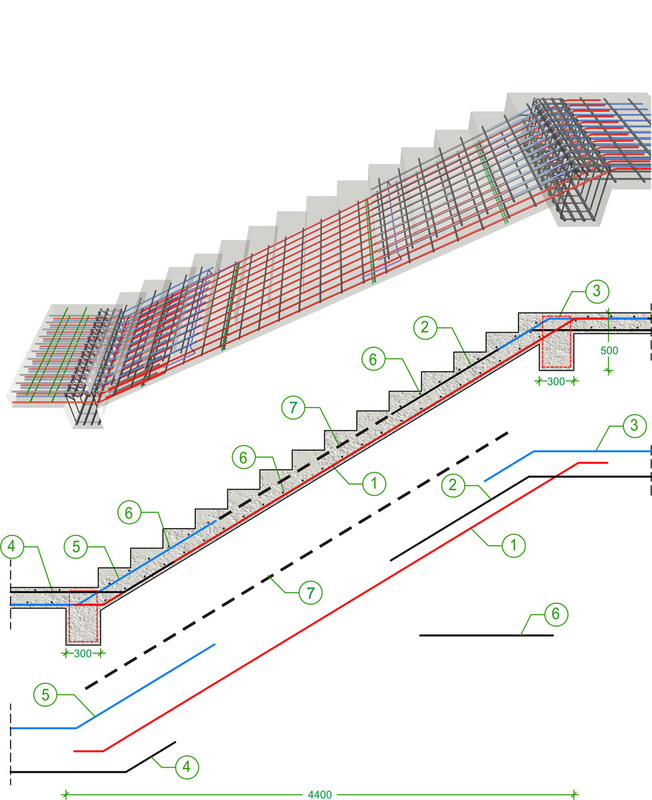 Most of the times, due to the fact that the accu-rate estimation of the staircase’s exact behaviour includes a large number of uncertainties, it is preferred to place reinforcement along the entire length of both its upper and lower surface (re-bars 7).